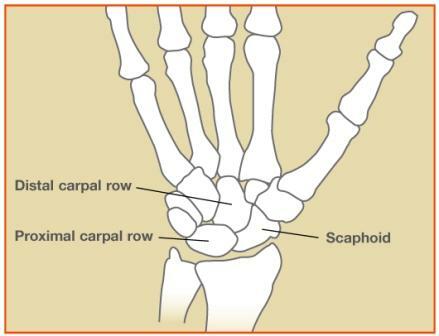 The scaphoid, one of eight small bones in the wrist, is most commonly injured due to a fall on one’s outstretched wrist. It occurs most frequently in young men in their teens to 30’s. A patient with a scaphoid fracture (i.e., broken scaphoid bone) will have pain on the radial (thumb) side of their wrist. They will often have pain with wrist range of motion and may also have decreased movement of the wrist. If a scaphoid fracture is suspected, X-rays should be obtained. However, X-rays will sometimes fail to reveal the crack in the bone if it is small, and thus additional tests such as MRI or CT scans may be ordered. If you have a scaphoid fracture, treatment is usually a cast or surgery. Scaphoid fractures heal slowly due to their limited blood flow. It may take several weeks in a cast before the fracture heals, sometimes 3-4 months is required. Surgery is recommended for certain types of scaphoid fractures and in some patient groups. In several studies, the healing rates are better and faster with surgery versus cast treatment. Surgery can often be done through a percutaneous or minimally invasive approach, but does have some possible complications and surgical risks. When a scaphoid fracture is not treated, the bone may not heal, and patients often experience worsening wrist pain, decreased range of motion, and stiffness. In time, these patients may develop wrist arthritis and may require surgical treatment in the future. Image copyright American Society for Surgery of the Hand. If you have an injury to your wrist, please call the Raleigh Hand Center to be evaluated by an upper extremity specialist.